Ten years ago, Lady Leshurr would’ve been considered a rapper, pure and simple. But today, the 29-year-old’s hugely successful online videos make her difficult to categorise. 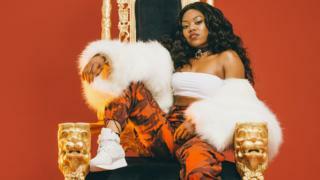 Leshurr (whose stage name is a play on her real name, Malesha O’Garro, and nothing to do with being a lady of leisure) is gearing up to release her debut album this year after releasing a string of hugely popular online videos. Just a few years ago, the Birmingham-born star was an underground rapper – you’d have been more likely to catch her playing small gigs or releasing mixtapes than uploading YouTube clips. But then, she launched her Queen’s Speech series – a string of videos, inspired by battle rap, each filmed in one continuous take. “I never expected Queen’s Speech to do what it did,” Leshurr says. “I took a year out before I started those. I used to just fling out songs here and there, but I took a break, and started to get to know myself. “Because, even though I had been doing music for ages, I didn’t feel like I had a proper trademark sound. Each of the Queen’s Speech videos took a different theme, and sees her rapping in locations as diverse as the Woolwich tunnel, a residential street in Los Angeles, an underground car park – or while riding a camel on a dual carriageway. But the lyrics of the songs attracted just as much attention as the videos she filmed for them. Their playful, comedic element rapidly became a crucial part of her identity. “People associate grime with violence and aggression, and I wanted to be the person to change that,” she says. Instead, garlic bread, Tetley’s tea, Postman Pat, cheesy Wotsits, Brexit, Snapchat, beans on toast and The Jeremy Kyle Show are among the things she has referenced in her songs. Her lyrics blend such pop culture references with politically-conscientious rhymes while also reading like an etiquette bible for the social media age. “I can’t stand girls who take their heels off when they’re in a rave / I’ll step on your big toe, just to remind you how to behave,” she spits on Queen’s Speech 3. “What you Snapchatting in the club for? Just dance man,” she advises on Queen’s Speech 4. However, lyrics such as these – and others where she refers to girls who go to sleep with their make-up on or whose “lips look like crispy bacon” – have earned her criticism from some quarters, who have accused her of being anti-feminist. But Leshurr says her words are intended to be read as light-hearted and funny rather than aggressive. “Some people just think I’m trying to slander women and put girls down. And it’s not that – it’s just the fact of me loving battle rap,” she says – referring to the live hip-hop clashes where two MCs take turns to diss their opponent. “It’s never that I’m trying to put someone down. It’s always like ‘Oh my friend always walks around in the club with no shoes on, that’s funny’, it’s not a thing where I’m trying to go directly at someone. It was the fourth instalment of QS – complete with the catchy “brush your teeth” chorus – that took her to the next level. It racked up more than 100 million views across all platforms, including 40 million alone from DeLorean, a prominent US Facebook account which shared it. Leshurr credits DeLorean with giving her the exposure that eventually led to Samsung using the song in one of their commercials. She had initially planned the Queen’s Speech series to be a quartet of videos, but after the fourth instalment went viral in such a big way she decided to continue them – and they got considerably more ambitious. “We went to Woolwich tunnel pretty late one night because we thought people wouldn’t be going through, but there were,” she says of the filming of Queen’s Speech 6. “So that took us about four hours to shoot because we wanted to do it without anybody else there. “And a lot of Americans thought that tunnel was CGI, because they didn’t believe we’ve got long tunnels like that in the UK,” she laughs. Another key Lady Leshurr trait is her distinctive accent, which shines through on every song. She was born in Birmingham, but her parents are originally from St Kitts. “When I was really young, I was rapping in an American accent, I didn’t really embrace my own accent back then,” she says. “But when I heard Ms Dynamite, I just thought, I respect what she’s doing, I wanna be like that – she’s using her accent, I should be able to use mine. But perhaps the most striking thing about speaking to Leshurr is how removed she is in person from the loud, brash, flamboyant personality you see in her videos. She’s hinted at her introverted nature in songs before. A year on from its release, she says little has changed. “I’m shy, I’m nervous, I don’t look in people’s eyes when I’m talking to them,” she explains. As she works towards the release of her first full-length studio album, Leshurr is now winding down the Queen’s Speech project (although she does say she’ll continue to do them “now and again”). In the meantime, she’s releasing freestyles and stand-alone videos (the most recent of which have included Black Panther, filmed on London’s DLR network, and the brilliantly-titled New Freezer) to keep her brand alive and fans happy. “Now I think it’s going to be more just proper music,” she says, adding that her first full-length album should hopefully be released this year. Why are West Brom's players recreating classic album covers?